Ursula Mamlok Interview with Bruce Duffie . . . . .
As we are now firmly into the 21st Century, it almost seems irrelevant to speak of hindrances concerning being a woman composer — or any profession, really. But we look back on those who slogged through the earlier generations and there is the entire range of ease-to-impossibility when it comes to living within any given situation. Surely, Ursula Mamlok had setbacks, including being part of the German-Jewish community in the 1930s. Her immediate family managed to relocate and she was able to continue with her life. Professionally she seems to have moved right along. Her catalogue of compositions is impressive and varied, there are numerous recordings to enjoy and study, and her students will carry her instruction into the future. 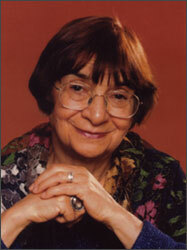 For a complete list of her works and recordings, visit her website . Mamlok became known to me through my friends at BMI, and we finally were able to set up a time for an interview. She was visiting San Francisco when I caught up with her for the conversation . . . . .
Bruce Duffie: I want to talk mostly about composing and teaching and your music, but first I want to ask about your early days. How did you wind up in Ecuador? Ursula Mamlok: Unfortunately this was the time of Hitler’s Germany, when we were persecuted as Jews. We couldn’t really escape to the places that would be desirable, like for instance the U.S. At that time you had to just go wherever you had a relative who would put a deposit down for you. My father had a cousin in Ecuador and he was the one who gave us the necessary papers. UM: Yes, yes. That’s an interesting story. My mother sent my music to somebody she had met in Europe who was a professor at Columbia. That led to sending my music to the Mannes Music School — now the Mannes College of Music — and I got a scholarship saying that if I could be in New York by the beginning of the next school year, I would be welcome to study with George Szell. So I left my parents who were still in Ecuador but didn’t have the affidavit that you needed. I was very fanatical about studying music and becoming a composer. BD: What exactly did you study with Szell? He was, of course, a conductor. UM: Yes, he was a conductor and had been invited to conduct Toscanini’s NBC Symphony. Because of the war he couldn’t return to Europe, so he decided to take a little extra job as a composition teacher. He was the one that taught George Rochberg, myself and Martin Boykan. We were his three private students. BD: You later studied with people who were composers. Was the conductor’s style of teaching composition different from a composer’s style of teaching composition? UM: Yes. George Szell was a very conservative musician; he conducted Stravinsky as contemporary music, but he didn’t like Schoenberg, Webern and so on. What he gave me was a solid background — of which I had already some from my teacher in Germany — of the classical repertoire, studying scores and composing. It was model composing of tonal music in the style of Brahms. Whatever you wanted to study, it sounded more or less like pieces one had heard and studied as a piano student. BD: I want to ask a question that might sound a bit indelicate on its surface, but realizing how far we have come, did Szell discourage you at all because you were a woman? UM: No, I cannot say that he did. He had a very high standard and he was very rough. Later, as I heard, when he was with the Cleveland Orchestra, he wasn’t loved as a conductor or as a person. He was feared! And he put this kind of fear into me. As a young student, everything had to be correct and that expressed itself. You couldn’t write parallel fifths; this was a rule in harmony, as you know! And you had to watch the rules of classical music. He couldn’t really help you if you came with something that wasn’t based in the principles of eighteenth and nineteenth century music. BD: So he wasn’t very forward-looking in composition? UM: No, no. Definitely not. But I learned a lot from him, and my music began sounding more like Prokofiev and maybe a little bit Hindemith. Those were the works that you heard in the 1940’s. Those were his favorite twentieth century composers, so the music of mine got somewhat colored by listening and studying those scores. But he mostly would stick to studying Wagner, but Wagner somehow didn’t have an influence on my composition at the time. 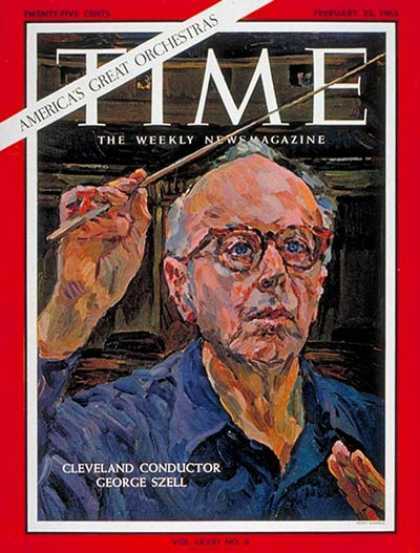 BD: One last question on Szell — did he ever eventually conduct any of your works? UM: No, unfortunately. Well, [laughs] this was very funny. At Mannes, I wrote a string quartet with him, and he went down to the auditorium and got together four string players and conducted them to show me how the piece really goes! He was an exceptional pianist! He could play anything at tempo! He was just a fabulous musician! BD: I’m glad you had a good experience with him. You then later studied with composers and you, yourself, taught composition. UM: Yes, yes. I still do. BD: Do you incorporate some of their techniques and their theories, or have you moved beyond all of that? UM: My own music still adheres very much to classical forms. I feel more comfortable with something where you have themes and things that were used in the so-called Classical Era. But I later on moved and have been interested to study Schoenberg and twelve-tone music, and studying with Ralph Shapey also was a great thing for me. Some of those techniques, plus something that I cooked up myself, I use in my own teaching. I usually let the student start where he is at to improve what he is doing. But I also like to give a student something to think about that he may not have thought about on his own. BD: Are you encouraged by what you see on the pages of your students? UM: Yes, very often I have good students that really wrote expressive music. And it’s very intriguing. This year I’m teaching at the Bennett School in New York, and I’m getting a young woman from Russia. I haven’t met her yet, but she signed up with me and that will be interesting. BD: Has she signed up with you because he has heard your music, or because she has heard of your reputation as a teacher? UM: She was Tania León’s student. Tania was a student of mine and recommended her. BD: There really is a lineage that has been passed on from generation to generation, from teacher to student throughout the history of music. BD: Do you feel you’re part of this long lineage? UM: I do, yes. I am coming from what is sometimes called the Middle European School, or the German School, and from Schoenberg and Webern as the end of nineteenth century but beginning of twentieth century composers. I probably am a follower there, although my music sounds quite different from Schoenberg’s music. And I’m passing that on to the next generation who will incorporate it with what they are hearing, and other influences that they are coming across. BD: So where is music going today? UM: I don’t know! Nobody knows. Music history goes in waves. There’s always a very complex idea of composers. Take Bach, followed by composers who write more homophonic music, like Haydn and Mozart. Then it gets more complex again in Beethoven and Brahms and Wagner. Operetta music started as a simplified classical music. Now we have had maybe sixty or seventy years of twelve tone influenced music, and while some of us still adhere to this, others have found this too complex; the total negation of this would be a minimalist approach. So these phases go in and out, and we don’t know what the next century will bring us. It probably will be much influenced by electronic music and many composers. Unfortunately I have no connection to it. I’ve written one electronic piece. I put it together in the studio at Columbia in New York, but it took too long. I said, “I can’t do this.” I’d rather use the pencil. Of course the computer music is the thing that will probably be developed much further. BD: But I assume it was a good thing for you to experiment with the electronics, at least even briefly. UM: Oh, yes, yes! Absolutely! The piece came out quite well, and I sometimes use it when people ask me if I have any electronic music. This one piece has been performed at a festival in Santa Cruz and even got a very good review! But it stands alone because I’d rather be a composer the old-fashioned way, with pencil and eraser! BD: When you have the pencil in your hand, are you controlling where it goes, or does it lead your hand across the page? UM: No, I’m controlling. I am controlling, although what comes out sometimes will lead me a different way than where I thought I would go. This happens. Now I’m in the midst of writing a string quartet for the Cassatt Quartet made up of four young women. They’re evidently well-known; they have some records out, and they play a lot in modern music concerts. What happens is that I set out with an idea, and then suddenly I see something or it does something. That’s a kind of miracle, maybe; one doesn’t know quite where it comes from, and it will have to be developed differently. Or it could be developed in so many different ways and you have to make choices. So perhaps the choice of that particular phrase of music is quite different than from what you first wanted it to do. So there’s control, and non-control. BD: When you’re working on it, are you also erasing and retooling it? BD: Sure! So my question is, how do you know when you’re finished? UM: I play it. I use the piano in composing; I’m not ashamed to say it, although some people think that’s no good and you should absolutely compose at the desk only. But I know when I’m finished by playing through and hearing through and reading the pages again. When it feels complete and when I can’t change it, I’m finished. It goes, of course, sometimes over weeks where the end will not sound right, and that is something that Szell said to me was very meaningful. He said, “A piece must have a good ending because that’s the last thing the listener remembers. If a piece has a poor ending, the whole piece is worthless!” There’s truth in that. BD: When you get a request for a piece, or a commission, how do you decide if you will accept that idea or turn it aside? UM: It depends how busy my schedule is and also whether I like the combination, the performers and the opportunity of where it will be performed. My last piece was for organ; that’s a very unfamiliar instrument for me so I did it as a challenge. People told me it’s very difficult to write for organ and it turned out to be that way. This piece was for the A.G.O., the American Guild of Organists. They had a festival centennial in New York and my piece was played four times. Unfortunately I wasn’t there; I had an accident with my foot and couldn’t travel, and I don’t know how well this piece worked because I have no recording of it. I’m a little bit afraid that I should maybe not have accepted that commission! BD: You can’t rely on the word of the people who were there to tell you it worked or didn’t? UM: No, no! Perhaps I will get a recording of it, but it depends so much on the organ. I heard that the organ where this piece was played was not the best and the acoustics weren’t good. With organ music, you really depend on that because the way you plan your registration — that is the orchestration of such a piece — is not the same on every organ. That can be a mishap, you know! BD: Of the pieces that you have heard of yours over the years, have you basically been pleased with the performances? UM: Yes and no. I have had very good performances and also not good performances. It depends very much how much time people give, and whether it’s a very experienced group to play difficult music. In general, yes. I’ve had an all-Mamlok concert with some of my music and those were all good groups; they were the best groups in New York that played and I got some very nice performances. Also when something is recorded, usually you get a better performance because the people edit it and really prepare it better than if it’s just the concert. BD: It sounds like really you just need to take more care. UM: Yes, absolutely. You have to. Unfortunately especially in New York the performers are so busy that they give it three rehearsals. No matter how difficult a piece is, three rehearsals are not enough! Recently I had a quartet for a performance in New York, and they had to pull in David Gilbert to conduct. He’s a fabulous conductor, but you certainly would not conduct a Schubert or Beethoven quartet, or would have ever thought of that. But today even small ensembles get conducted. It’s simply faster to get it on its feet. BD: To be taught, rather than to learn it? BD: Your music is at least a little bit difficult. Do you write it to be difficult, or do you write it just the way it has to come out? UM: Just the way it has to come out. My music has also gone through its own history. I started as a tonal composer and I wrote pieces there that were not too difficult to perform. Then I got interested in different kinds of phraseology and rhythms that were not square. At first I wrote very predictably rhythmically, and especially with Ralph Shapey I was learning a lot about asymmetrical rhythms. The music became more difficult for the performer because it was new. The performers in the sixties were not as used to this type of music as they are now. BD: Are they getting more used to it? UM: They are getting more used to it. In my own case, my music gets simpler. Why is this? I don’t know. I just feel I don’t need some of the very mathematically complicated combinations to express what I want to express. So I write music that maybe goes back in my own history to former musics. BD: This is not to say you disown any of your earlier pieces? UM: No, no! Well yes, some I do. I usually start with my Woodwind Quintet which I wrote when I was a student at the Manhattan School. It’s my longest piece that is recorded; it is on a record — a CD — with the Quintet of the Americas. That is a piece that is not so tonal. It’s a chromatic piece, but it’s simpler in concept than pieces I wrote after 1961. I started to get interested and tried out what I could do with twelve tone approach, and that was very difficult for me at first. I had to teach myself, really, because nobody taught classes in that technique at the time. And now it is not taught either, because today it’s passé, they say! So you never know! Today you have to make a secret of it if you want to be a composer who composes twelve-tone music. You better not tell it to the audience because they will automatically think that it’s incomprehensible kind of stuff! BD: We’re kind of dancing around it so let me ask the question straight on — what is the purpose of music? UM: Ah! That’s a good question. The purpose of music is probably that if you are gifted in music, to express yourself as somebody else would be in writing stories or poetry. The purpose is to not entertain, but to give people something that could be either uplifting or disturbing; something for people’s emotional life. Perhaps there is also an intellectual purpose, depending on what kind of music. BD: Is there no entertainment value at all in it? UM: Yes, there should be, but the word entertainment often is coupled with show music or light music, although that isn’t necessary because certainly a scherzo in a Mozart or Beethoven symphony is something that can be lighthearted and therefore entertaining. In my music, I feel I have a lot of contrasts and often a kind of humor. People tell me that’s what they are getting from places in my music. So entertainment is an important aspect of my music. Also an important thing is educational music, of which I have written quite a lot. Piano music or orchestra music for children. This should be not talking down to young people, but rather give them something that has the sound of our time but still is geared toward a younger mind. Children can really accept much more than you sometimes give them credit for because they are not inhibited and prejudiced against so many things that adults, and some of the so-called music lovers, are. BD: Is there any way that we can encourage more listening to new music and more audiences from various places to come to new music concerts? UM: Yes. We are always trying. Various new music groups are trying to play music in different styles, since we have many styles of music nowadays. I believe that new music should be played within a concert of not only new music, but ones that include music that people will know. They might get the message and want to hear more of this type of music, so then there are the special concerts that feature mostly new music. BD: But you would rather be on a mixed program? UM: I would, yes. I had a wonderful time with the San Francisco Symphony when I composed a piece for them with a commission, and Herbert Bloomstedt was conducting. [See my Interview with Herbert Blomstedt.] It was on a program with Beethoven’s Seventh Symphony, and Bartók’s Violin Concerto. BD: You were in good company! UM: I was in good company, and the violinist was Midori, so the house was filled to capacity! BD: This didn’t hold any terrors for you, did it? UM: No, no. I got good reviews and comments, and people seemed to enjoy it. BD: How can we get more conductors, then, to champion this kind of thing? UM: That’s very, very difficult. If a piece is played once, it’s often very difficult to have another orchestra or conductor do it. The conductors who do new music always want to have a premiere. BD: There’s something prestigious about that? UM: Yeah. It’s very difficult to get that second or dozens of performances of a new piece. But it can be done. I had two performances of this piece so far. The promotion is a very important aspect. Most composers, like myself, have no agents. You’re busy composing the piece, making the deadline, copying, being at rehearsals and doing all the things necessary, so you have no time — at least I have no time — to call up conductors. It’s also an embarrassing kind of element to advertise your own music. UM: [Laughs] Yeah, that’s right, you know! People do it, and do it successfully, but I am not that way, unfortunately. It’s very difficult, but the publisher will. I’m published by C.F. Peters, and he’s a very reputable publisher, but not for promotion so much. The music is there and the people who know about the catalogue of C.F. Peters will find it. But one does actually need a promoter to do with any kind of art and commercial things that do need advertising. It’s very costly. BD: It seems that there are a number of composers who are very good at promotion, but their music is not really work promoting. UM: Right, that happens! Yes, yes! That happens as in all other ways of life. Sometimes a good car is not promoted as much as an inferior one. It’s a lifetime struggle, and yet we do it. BD: I assume that you shouldn’t think of music as a commodity. UM: No, you should not. But in a way, certain music is, of course, a commodity; it has mass appeal and is sort of anonymous. Much of a popular kind of music has this. But you do not reach more than an elite group of other composers to listen to your music if it doesn’t get publicized. Not that it’s a commodity, but as something that would be worthwhile to get among people which are not only your own colleagues. BD: A number of your pieces have been recorded, so that gives them a little more universality. UM: Yes. That is very important. Today a recording is more important than publication because everybody can purchase it... although the music of composers like myself is often hidden in the record shops. Or you have to ask for it, and then it will appear in the computer, and the clerk says, “Ah, yes, this does exist, and can maybe be ordered!” [Both laugh] The radio does a lot of service for the composer because you have the recordings there and you advertise us by announcing it. BD: This is, of course, what I do with my programs! UM: Yes, yes, that’s very important. We haven’t enough good [commercial] radio stations, and maybe a few university stations. BD: Right, exactly. Well, I try to do my part. UM: Yes, you do! I know! BD: One last question: is composing fun? UM: Ah, that is a mixed question! [Laughs] I find that once I’m at it and do it, it’s fun and it’s interesting and challenging. But sometimes you feel, my goodness, this is such a difficult problem I’m now having to overcome in this certain piece. You don’t dare to get at it and you do all sorts of other things first before getting to the work! So it’s a mixed blessing, for me at least. Of course it’s wonderful once a piece is finished, and you look at it and it caps off and sounds good. It gets performances and you feel the work has been worthwhile. But I often feel I won’t be able to finish this piece or be able to go ahead! I guess many composers have that kind of problem. BD: But it always manages to be completed? BD: Do you have any advice for the young composers coming along? UM: I feel the young composer should always study the history of music and be very well acquainted with the music of all ages and all types, and then make choices where they want to hook in. Nobody composes in a vacuum, and you have to have your influences partly from the country that you’re coming from, the musical surroundings and the teaching. I feel one should have always an open mind to absorb as much as possible. I always say to the young composers, “You must hear a lot of concerts. Don’t rely only on recordings because that is quite different. Music is also an art to be seen.” It’s very interesting and great fun to observe a pianist or a chamber group or an orchestra. Rehearsals are most important, I think, for a composer. BD: I appreciate your taking the time from your visit to San Francisco to chat with me tonight. UM: Oh, well, you’re very welcome. That has been great fun! 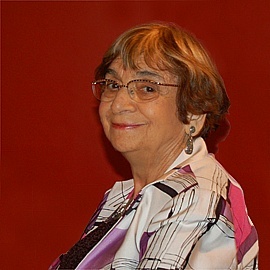 Ursula Mamlok began her study of music in her native city of Berlin, and continued at the Mannes College of Music in New York with George Szell. She earned Bachelor of Music and Master of Music degrees from the Manhattan School of Music. She also studied with Roger Sessions, Ralph Shapey, and Stefan Wolpe. Among her numerous commissions are those from the Koussevitsky and Fromm Music Foundations, Alaria Chamber Ensemble, Eastman School of Music, Earplay and The San Francisco Symphony. She has received awards and grants from the National Endowment for the Arts, Meet the Composer, the Martha Baird Rockefeller Foundation, and, in 1995, a Fellowship from the Guggenheim Foundation. Her works are regularly performed by major domestic foreign ensembles and have been recorded by the CRI, Gasparo, Leonarda, Newport Classic, Music and Arts, Opus One, True Media, and Centaur labels, and are published by C.F. Peters Corporation, American Composers Edition, McGuinness and Marx, and Hildegard. 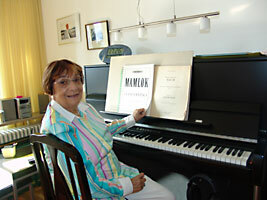 In 1987, Ursula Mamlok received a Commendation of Excellence "for her contribution to the world of concert music" by BMI. 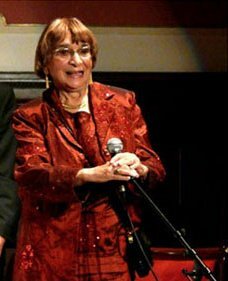 She has been on the composition faculties of New York University, City University of New York, Temple University, and the Manhattan School of Music. She is also a board member of the League/ISCM. This interview was recorded on the telephone on July 25, 1996. Portions were used (along with recordings) on WNIB in 1998. The transcription was made and posted on this website in 2009.